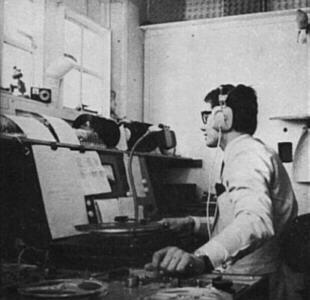 Formerly called Radio Sutch when it was started up by pop singer and parliamentary candidate Screaming Lord Sutch in May 1964, the station was renamed Radio City when it was taken over by Reg Calvert in September 1964. 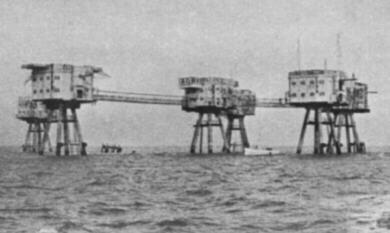 The station was based on an abandoned war-time anti-aircraft fort on Shivering Sands off Whitstable, Kent, in the Thames Estuary in England. Radio City broadcast on 299 metres, 1003 kHz with a general pop format and Top 60. Request programmes and some religious and cultural programmes also went out from "The Tower of Power". The station was very popular in the south-east of England and the signal could also reach Northampton and Birmingham. Some very sad occurrences are connected with the station and they are well documented elsewhere. 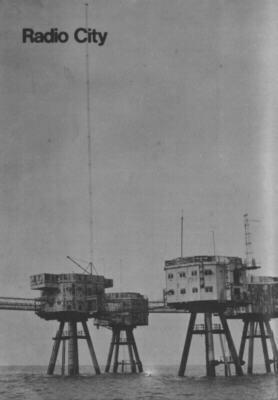 After a court case and a fine of £100 for broadcasting within territorial waters, the station closed down on 9/2/67. Radio City recordings are quite scarce and the museum has a few, but could do with more. In the Radio City studio with Tom Edwards on air. Shivering Sands Towers during a visit from the tender.